Last night while Erik and I were coloring eggs for the Easter Bunny we thought it would be fun to snack on an Easter treat. I had always wanted to try out Cadbury Egg Shakes so we gave them a shot. 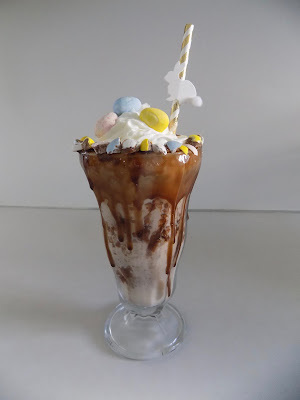 We just used our usual milkshake recipe and added the candy eggs. Our recipe is very simple so feel free to use your own. We tried shakes with Mini Cadbury Eggs and Caramel Creme Cadbury Eggs. 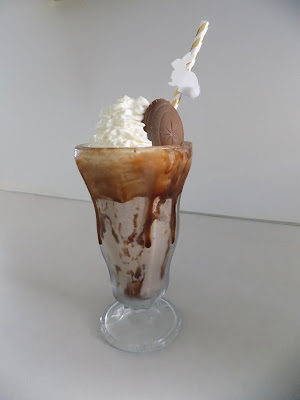 We decorated our milkshake cup with chocolate sauce and added some crushed eggs around the rim. We finished it off with some whipped creme and a couple of Mini Cadbury eggs on top. We decorated our milkshake cups with chocolate sauce and added whipped creme and half a Caramel Creme Egg on top. Both of the shakes were delicious but we both preferred the Caramel Creme shake. I would even suggest adding a little Caramel Sauce if you want to enhance the flavor. This was such a fun Easter treat to enjoy while decorating eggs. I think it would be the perfect way to indulge in some of the Eater treats the Eater Bunny brought you too! What type of eggs do you prefer?